Nanni Galli was best known as a saloon and sports-car racer, whose achievements included second in the 1968 Targa Florio and fourth in the Le Mans 24-Hour later in the year. 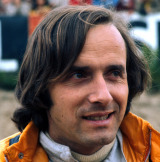 His four-year intermittent spell in Formula One was not overly successful, although he finished third in the non-championship Grand Prix of the Italian Republic in 1972. That year came his one drive for Ferrari when he managed 13th at the French Grand Prix. After a spell, again unproductive, with Williams in 1973 he stood down from F1.